Chester County and the surrounding megalopolis are gearing up for an anticipated big snow event starting Friday evening. The chatter has been heavy in the West Chester area about sledding, snowmen and more. West Chester’s John Young, always scheming, dreamed up a Snowman Rodeo with the idea of building an army or calvary (or cavalcade?) of snowmen this weekend and needed a cowboy snowman for his flyer. Luckily I was using a tool for work that takes an incredibly long time to save database changes. 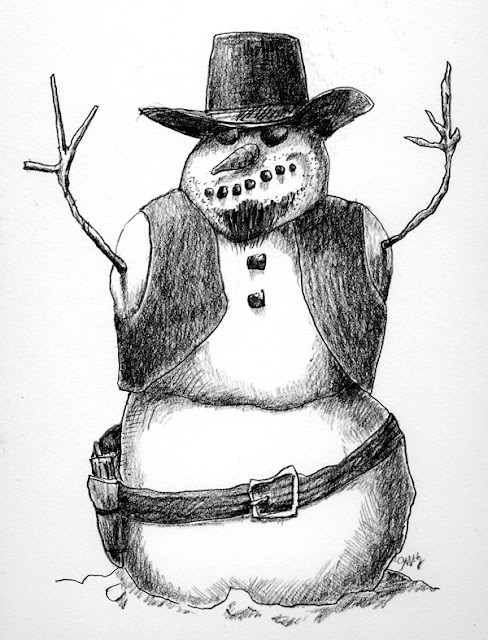 So each time I saved, I worked on my cowboy – gunslinger snowman. I added a goatee after realizing I forgot to leave space for the requested mustache. Maybe it will help appeal to West Chester hipsters. For more Snowman Rodeo info (which will include camping out at Snowman Rodeo HQ (West Chester Scoop) and enjoying hot cocoa, movies, and shrinky dinks, click here and/or follow @tikaro. This entry was posted in cowboy, drawings, gunslinger, snowman. Bookmark the permalink.